Three Americans and and Australian that meet in Montreal Canada and start making music, that is the story of Ought in short. In the lively artist scene over there, it was possible to experiment as much as they could. This already resulted in the first record More Than Any Other Day with intense and impressive songs. The follow up Sun Coming Down was highly anticipated with great expectations and has been streaming on SoundCloud for a while now. On that LP there are eight brilliant songs, that once again leave an impression. The quartet builds on top of the first album, but plays the tracks even more convincingly and with more finesse. The music is even more spot on and gains sharpness and intensity because of that. The nervous, threatening atmosphere is still there, better yet it only got stronger. Singer Tim Darcy's nasal voice is talk-singing his often endless repeating lyrics, stringing together the words in high speed. Together with the repetitive grooves they turn into a kind of mantra, that is being hammered into your head bit by bit. It is striking how creative the band is doing this, with wonderful drum parts and guitars that sometimes are screaming and shredding and other times play lovely ringing tunes, and well timed tempo and rhythm changes that add extra tension to a song. You can hear beautiful drum fills and nice guitar melodies in the melancholic 'Passionate Turn', where the band is going full force in 'The Combo' with a very stormy beginning. In the end all builds up to the epic 'Beautiful Blue Sky' halfway, which is also the first single. The song brings Television to mind, like other songs, and it's where the band brings it all together. "War plane, condo, oil freighter, new development", Darcy sings, after which he endlessly seems to repeat "I feel alright", followed by "I am no longer afraid to die, 'cause that is all that I have left, yes". It characterizes the atmosphere of the songs, where they look at the world, the daily grind many of us are in and the cold heartless side of technological progress we became so dependent upon. It is more of an observation than a depressing conclusion, where the uneasy feeling it raises, perfectly finds its way into the music. It turns Sun Coming Down into one of the most intriguing records of the year and one you really should give a spin. Together with convincing shows on Lowlands and Into The Great Wide Open, Ought is a band to watch since things could move quickly for them. 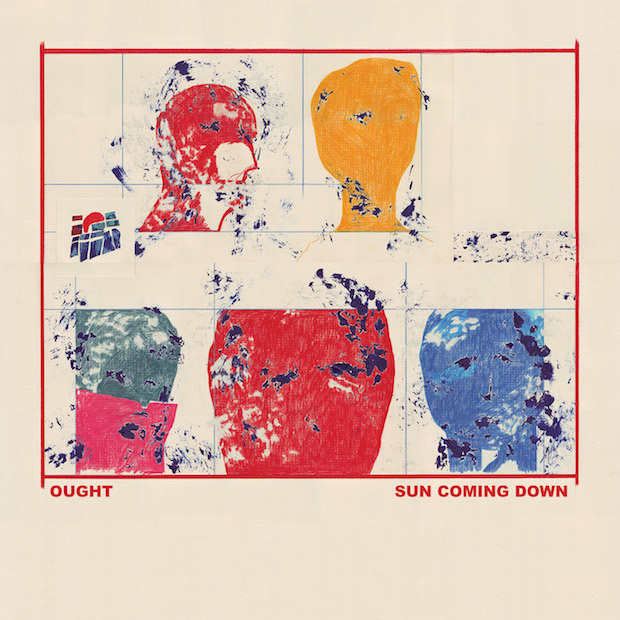 Listen to 'Sun Coming Down' on Spotify.